The doors of the senior national team are not totally shut on Kevin Prince Boateng, the Ghanaian German who plays for Barcelona. Reports reaching Yours Truly state that coach Kwesi Appiah is ever ready and willing to recall him if he apologises on what happened in Brazil during the 2014 FIFA World Cup. Many football fans feel Boateng has the quality to help the Black Stars to win their 5th AFCON. Ghana has not won the African Cup since 1982, and the team has always performed well to be in the best four in the last five tournaments. Kevin Prince Boateng is one of the dreaded stars who can contribute much to the team, and most of his fans want him to show some respect by apologizing and participating in the 2019 AFCON. Sulley Muntari, one of the stars who rebelled in Brazil has sent an apology and many Ghanaians want to see his quality in the Black Stars again. 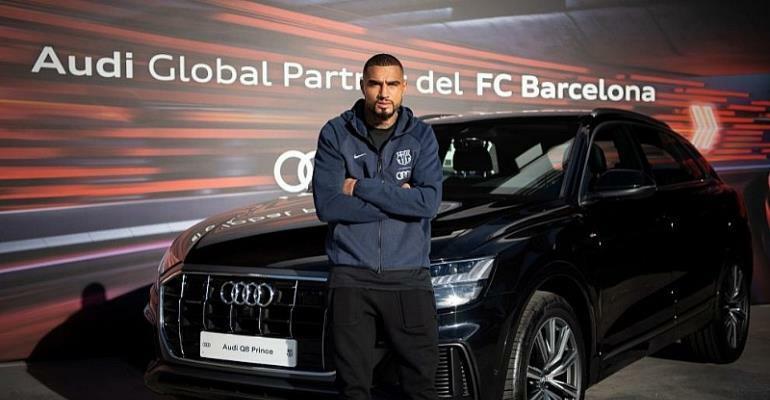 Kevin-Prince Boateng was among a host of Barcelona stars to receive new cars from car sponsors, Audi. The 31-year-old was handed a brand new Audi Q8 as part of the company’s sponsorship deal with the club. The former AC Milan and Tottenham star just like his teammates pose with his new gift after receiving. Boateng joined the Spanish side in the January transfer window as a back-up option for Uruguayan Luis Suarez and has since made just two appearances since joining the Club. Boateng is in contention to play as Barcelona host Espanyol on Saturday.